Isn't it always fun to go on holiday with your friends? You get to meet new people. You experience new things. And generally a great time is had by one and all. Well, sometimes it is anyway. Unlike these poor saps in this creepy horror classic Directed by: Sam Rami; and Starring Bruce Campbell, Ellen Sandweiss, Betsy Baker, Richard DeManicor, and Ted Rami. It was made in 1981 and lasted for 85-minutes. Now it's not every day that square-jawed romantic, Ash (Bruce Campbell), is forced to chop up his girlfriend, Linda (Betsy Baker), and then dump her remains in an unmarked grave situated with a haunted forest. Well, it all began earlier that same day, when Ash, Linda, plus their friend Cheryl, Scotty, and Shelly (Ellen Sandweiss, Richard DeManicor, and Theresa Tilly), all travel to a deserted cabin situated in the middle of nowhere, to have a nice holiday together. It then continues when they come across a scary-looking dagger, a creepy-looking old book, and a harmless-looking tape-recorder, down in the cellar beneath this cabin. And finally it all really kicks off when they play what's on the tape. Listen, just think about it for a minute or two; how was anybody supposed to know that this cassette was going to conjure up a dark spirit lurking within the woods, which would corrupt these five friends in the process? For example; Cheryl gets touched up by some twigs before turning into a monster. Likewise for Shelly too, though she does not get 'twigged' or locked in the cellar -- she goes to pieces instead. And as for Scotty, Linda and Ash? Scotty gets scratched to smithereens. Linda turns into a laughing Looney. Plus Ash is forced to defend himself any which way he can. Though, that is most probably why what next transpires is a right coming of age tale I can tell you. As monsters moan - spirits groan - cabins cook - and who said it was a bad thing to burn a book? OK, 'Evil Dead', what's it really like? Well, the story is so simple that I could write it whilst squirting on the toilette. The special-effects could only scare people who are afraid of balloons and scrambled-eggs. Plus the acting is pure 'William Shatner' through and through. So why do I love horror movie so much then, huh? Is it because I am a big Sam Rami and Bruce Campbell fan? Is it because my medication plays tricks with my mind at times? Or is it because the first time I saw this movie, for some strange reason, I fell in love with it straight away? In England during the eighties there was an old-school Irish comedian called Frank Carson (click here to not read any of his jokes). Now Frank had a catchphrase that rings very true where this film is concerned -- 'It's the way I tell 'em' -- mainly due to the fact that this movie is so great, because of the way Sam Rami and company tells it. You see, as I said previously, there is nothing to this film 'story-wise' in the telling. However, when you add some superb artistic touches like Sam has within this horror film, combined with the rustic and raw charm of all the actors as well, you cannot help but stand up and take notice that something truly special is unravelling before your very eyes. The camera work is both inspired and atmospheric. The moody sound-effects enhance and titivate at the same time. Plus the simple narrative and the holistic performances make this movie into the classic that it has now become. Do I need to say any more than 'have a look at this'? (1) To raise money for this project, high school pals, Bruce Campbell, Sam Rami, Ellen Sandweis, and Robert Tapert, made a short film in 1978 called 'Within the Woods'. Now it shared a similar story-line to this piece, but Sandweis was the main character. (2) This film cost $375,000 to make, and was shot over a period of one and a half years, with a number of notable gaps in between. (3) American Movie Classic's host, Bob Dorian, was the voice of the professor on the tape recorder. (4) The actress who play's Linda -- Betsy Baker -- had a hard time on this film. The white contact-lenses in her eyes prohibited her from looking at what she was doing. Plus she lost her eye-lashes when her make-up was removed from her face. 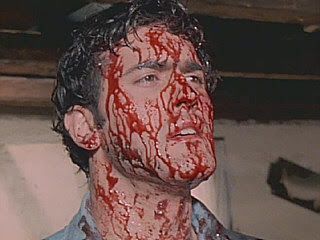 Bruce Campbell suffered just as much also. (5) In the scene where all of the characters were listening to the tape recording in the cabin, originally they were all supposed to be smoking marijuana. Now although this scene was shot, ultimately it was unusable because of the actor's uncontrollable behavior. (6) Ash is never given a last name in any of the films, but Sam and Bruce have alluded to either 'Ash Williams' or 'Ash Holt' as a possibility. (7) The term 'fake shemp' was coined by director, Sam Rami, because there had to be a number of 'stand-ins' on-board due to the amount of time it took to make this flick. 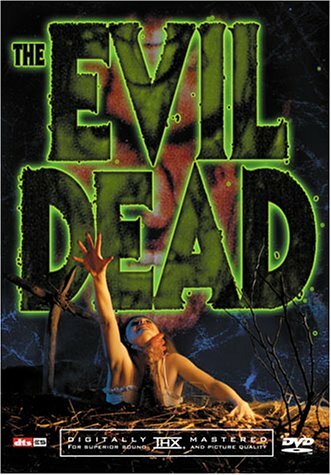 (8) At first this film was called 'Book of the Dead', but the producer, Irvin Shapiro, changed it to 'The Evil Dead', because he thought the initial title would turn the kids off of watching it -- due to its literary reference. Moreover, in German, this movie is entitled, 'Dance of the Devils'. (9) Joel Coen, of the Coen Brothers, was an assistant editor on the film. (10) When this picture was released in the 1980's, it was banned in Germany, Iceland, Ireland, and Finland, because of the amount of violence it had on screen. In England it was categorized as a 'Video Nasty', and was only 'officially' released in 2001. (11) Horror legend, Steven King, loved this film so much, that his praise helped it get promoted within the industry. (12) This picture was turned into a Broadway musical in 2006. Overall 'Evil Dead' is a great film to watch. 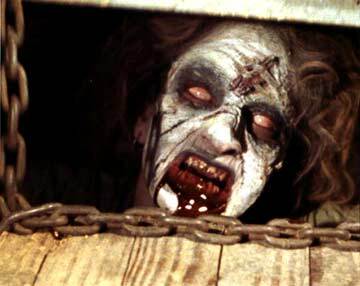 Admittedly, in my own humble opinion it isn't better than its sequel, 'Evil Dead 2' (click here for review). Nonetheless, it is one of those films that is a blast to watch on first viewing, and it will captivate you enough to come back again and again and again, just for the shear hell of it. Agreed Bruce?